So I finished my first Christmas read ever! This year I wanted to read a book that was very Christmas-y and would bring me into the holiday mood and festivities. It worked... It was the first book I've ever read that was like this and I'm really excited to talk about it: My True Love Gave To Me by 12 different authors. 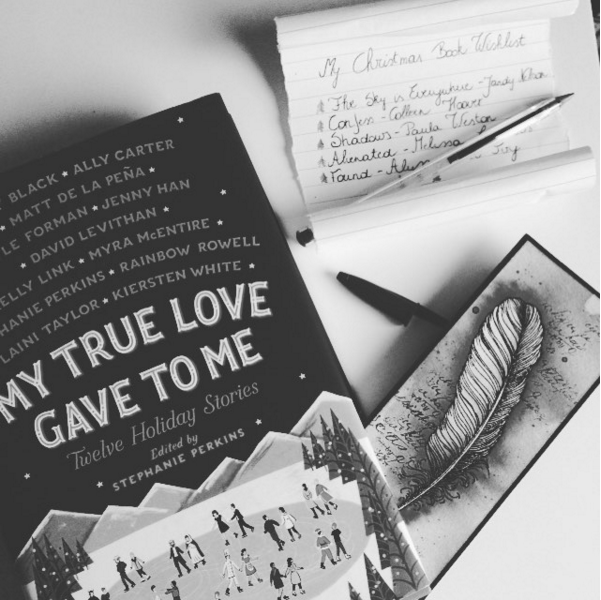 This book consists of 12 different short stories and each is written by one of these authors: Holly Black, Ally Carter, Matt De La Penã, Gayle Forman, Jenny Han, David Levithan, Kelly Link, Myra McEntire, Stephanie Perkins, Rainbow Rowell, Laini Taylor and Kiersten White. And all of these Twelve Holiday Stories are edited by Stephanie Perkins. Now, I want to start with the cover! It's absolutely well considered! It's a skating rink with 12 pairs of couples and yes, every pair represents one story. In the beginning I found it hard to fine them based on what I got in the stories but eventually I found each and every one of them! I also bought it as a hardcover and just strip away that jacket! It's a total red cover, which I link with the festivities since red is a very nice color for Christmas. Into the front is also the title carved out which I thought was a very nice detail into it! Next up are the stories. The first story I read was Midnights by Rainbow Rowell. It's about New Year's Eve and we get a little teaser of what happens on New Year's Eve that same year but then go back in time to see why this actually happens. After the flashbacks we get back to the present and see what happens next. I honestly fell in love with this story! The characters were really funny and I did laugh some times which is a very good thing, of course. It also made sure you kept reading because you want to know if your suspicions are right. I don't want to spoil more but I can only say I wish that this happened to me on New Year's Eve. The second story is one written by Kelly Link, The Lady and the Fox. I didn't immediately got it, to be honest. It took me a while to understand who the character was and whether or not she was a family member or just a friend of the family. Once I understood that bond, mysterious things start to occur. I liked it that their was mystery, I never thought mystery and Christmas could go together until now. I do have a tiny remark! The mystery resolves itself in the story of course but I think there wasn't enough around it. It all happened to fast which I wasn't very fond of. It took away the thrill, in my opinion. Other than that I really liked this story, but it's not my favorite in this series of 12! Next was Angels in the Snow by Matt De La Penã. I never read a story by this author but I was really curious. Especially after I saw the illustration of a cat above the beginning. I didn't see the link with the angels and the cat. Soon things became clear to why their was a cat as an illustration. The character is catsitting the cat and gets stuck in the building with only one other person somewhere around because of the snow. They meet each other some pages further because the girl doesn't have any running water. Ever since that moment, the two get a long pretty good until Christmas Eve... The only question that remains is: Will everything end well? That is something you should find out! The fourth story in this lovely book is by Jenny Han, also known as the author of To All the Boys I've Loved Before which I'll be writing a review on soon, Polaris Is Where You'll Find Me. This story is in my top 5! It was well written, it really got that Christmas spirit in it but it also broke my heart a little. The main character used to made up stories when she was little and now nobody believes her when she says anything. That already broke my heart because come on! Who didn't make up stories when they were little? It doesn't define us now, does it? And then again, a story that's in my top 5 probably at the very top: It's a Yuletide Miracle, Charlie Brown by Stephanie Perkins. This story was not surprising, I think we can all see what would've happened but still, it grabbed me and stuck with me after reading it. The main character has had a rough year and together with her mom she lives in a small apartment because they aren't that rich. The girl also makes special video's with voice overs. It'd be her ticket out of this horrible town, in her point of view. Ever since that I was thrilled because she needed a special voice and she goes all spy on him. It even comes that far that she buys a big Christmas tree where he has to help her with. Carrying it to her home but then only come to a surprise. Together they try to find a solution for this problem and that gives us very funny moments. It's during those moments that you know that you were right all along. What you thought would happen, is probably going to happen. Normally I'm a little bothered that the surprise is already ruined but I didn't mind it here at all. The ending was also a lot more different then I imagined. I adored this story so much! Afterward came Your Temporary Santa by David Levithan. It was okay, I just didn't think it was really special and it didn't blow my mind. I did think it was a very original concept, in fact I thought it'd be such a good story. The ending though, that's what kind of made it just 'okay' for me. It would've been even more thrilling for me if funny things happened. It was also a story with the main character begin homosexual and then I'm all ears. Somehow I think stories with boys that fall for boys are really stunning and really capture the feeling. I kind of missed the relationship in it! The girls were cute. It's all about the magic of Santa but in order to explain that, I'd have to spoil which I will not do! My number two in my top 5: Krampuslauf by Holly Black. This story sticks with you like a bee drawn to honey! I never knew what 'krampus' was until I saw it in a TV-series, NCIS if I'm not mistaking. I don't know if it's something special for a specific place on earth but to all those who don't know what Krampus is: apparently it's some sort of Demon that comes from the Alps folklore. I think it's alike to what we here in Belgium have, which is Saint Niklaus. It's someone who gives presents to the good kids and 'takes' the bad kids with them. But from what I see, the creature is really terrifying! Anyways, the beginning of the story is something a lot of teenage girls will feel connected with so I already was fond of that. The next thing that happens is the main character who'll be hosting a party to solve the problem that's explained in the beginning. Things happen and more paranormal creatures will come take a visit. I honestly can't say much or spoil the story... but I swear this story is special and so nice! It really wandered in my mind for the next few days and I only can say good things about it! The 8th story in this book is by Gayle Forman: What the hell have you done, Sophie Roth? This was a story I didn't understand at all in the beginning, it could've just been me I don't know! I just wasn't into it I guess? I just didn't feel any feast joy as I did with the other stories and it was kind of what I expected. Towards the end I did come to terms with it and appreciated what happened between the two most important characters and the ending was really stunning but I think it's a pity that I didn't like the beginning of it. Only four stories to go! Beer Buckets and Baby Jezus by Myra Mcentire. This is also a story in my top 5! It's the second story in this book that has the point of view from a boy and I really liked that. The guy is known for his pranks and one day he gets in big trouble because of them. It does bring him some sort of luck and some very sweet luck. He always felt like he wasn't good enough and that some popular guy, who we meet during the story, was the best there was. Throughout the story we get to see how he struggles with what he wants and how he sees himself. It changes him and he becomes some lucky boy! It was the joy of festivities combined with what teens struggle with nowadays: insecurities and that's what really sealed the deal for me! Something totally different was Welcome to Christmas, CA by Kiersten White. Apparently there are towns called Christmas. It struck me as something weird and very surprising and made sure my imagination went running wild. The story made sure you kept reading because you wanted to know what was going to happen. Especially when a cook comes working in the dinner and makes dishes specifically for each customer. He doesn't follow the menu, he makes what he thinks they need to be happy again. It goes from meals they have eaten in the past, to meals that reminded them of some pleasant day. I thought it was going to be magic and that he was Santa but camouflaged as a cook! But we get to know that that isn't the case at all! The girl is really fascinated by him but wants to keep distance. She wants to go away from this little town that's called Christmas and therefore she needs to stay away from everything and everyone she could get attached to. Will she flee and find a better life? Read it for yourself. Another one of my favorites! Star of Bethlehem by Ally Carter. Why was it so special to me? Because the main character just switches her plain ticket with another girl! What kind of normal person does that? She was supposed to go to New York city and now she switched it and came in the middle of nowhere! That only brought suspicion to me. Why would somebody do that? At first the family didn't see any differences with the actual girl that was supposed to come. Only the boy knew and she kind of felt bad for that. The family starts getting attached to her but she only wanted to stay for a day, maybe two and then flee. My suspicion arose every minute in this story... Who in hell is she running from? What is she running from? My prayers for answers are answered by the end of the story. It really kept you reading and the end of the story was really good! I was really fond of this little tale because of the mystery in it combined with again that Chirstmas-y spirit! And last but not least The Girl Who Woke the Dreamer by Laini Talor. I read this story today and finished the book but I didn't get into it really fast. It was kind of the same as with the story of Gayle Forman. I couldn't really imagine it in the beginning which is why it didn't entertain me until the last pages of the book. As the title said there is 'the Dreamer' and he brought some thrill and mystery into the story. Also the author chose for a two points of views which is a big YES! I'm very fond of stories that take the POV of two characters so this is what made it more than okay! Also the ending doesn't uncover the whole mystery. I wished I knew more about 'the Dreamer' but I guess the author did that on purpose and left room for my own imagination. I do recommend the book to everyone who wants to read a story that has Christmas joy in it but still has variety to it. The stories weren't the same concept at all and each gave you a different perspective on either Christmas, New Year's or for example Hanukkah. Also, if your doubting to pick it up because there are a lot of authors you don't know, just pick it up! I only knew 3 of the 12 authors and I really enjoyed most of the stories. It also gives you new authors to check out. 24 hours left before Christmas Eve!